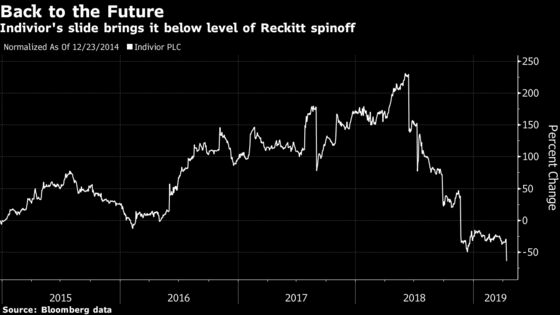 Indivior Plc plummeted to an all-time low after U.S. prosecutors said the U.K. drugmaker deceived doctors about its addiction treatment’s dangers, fueling a deadly epidemic of opioid abuse. Indivior misled doctors and government health programs into believing that the drug, Suboxone Film, was safer and less likely to be abused than rivals, the Justice Department said in a statement Tuesday. The company’s stock fell as much as 75 percent in London, shriveling its market value to 204 million pounds ($267 million). Here is what analysts say about Indivior. Reckitt Benckiser shares fell as much as 4 percent in London trading. The company said in its annual report it could incur liabilities from the case. Federal prosecutors in the Western District of Virginia said Indivior’s deceptions had contributed to an epidemic that has killed thousands of people. “Indivior obtained billions of dollars in revenue from Suboxone Film prescriptions by deceiving health-care providers and health-care benefit programs into believing that Suboxone Film was safer, less divertible, and less abusable than other opioid-addiction treatment drugs,” said the prosecutors. The U.S. government badly misread the science around the drug as well as the company’s efforts to promote it, according to Howard Pien, Indivior’s chairman. U.S. states, cities and other local governments have largely focused their legal efforts on the makers and distributors of opioid pain pills. Indivior has held itself out as a solution to the epidemic of abuse, even though there have been reports that Suboxone can be misused. Suboxone Film is a combination of two drugs, buprenorphine and naloxone. Buprenorphine belongs to the opioid family, though it has been shown not to create the euphoric effects of other pain drugs. Naloxone is an opioid-reversal agent. Together, they purportedly have the effect of satisfying some of the addictive need for opioids while curbing sensations of withdrawal. Prosecutors said that Indivior marketed Suboxone in a way that allowed some patients to misuse the drug, and did little to stop such practices. They cited a program called “Here to Help” that they said was used to increase prescriptions. “Indivior used the program in part to connect patients to doctors it knew were prescribing Suboxone and other opioids to more patients than allowed by federal law, at high doses, and in suspect circumstances,” prosecutors said.